- Players start with 20,000 in chips and the levels are 50 minutes in length. Brian O'Donoghue Wins the $400 Deep Stack! Brian O'Donoghue and the Micros Run Good! Brian O'Donoghue is the Champion of the $400 Deep Stack event at the Foxwoods World Poker Finals. He takes home $30,624, the World Poker Finals Trophy and watch! O'Donoghue has the lead until the flop comes down [Kd][Qd][3c]. Liang jumps ahead with a pair of kings. The [7d] comes on the turn but the [Js] falls on the river, giving O'Donoghue a straight and the pot. Tod Liang is eliminated in 2nd place for $14,951. The board runs out [Ac][Th][7h][5c][Qd] and Liang pairs his ace to win the pot and eliminate Bionco in 3rd place. 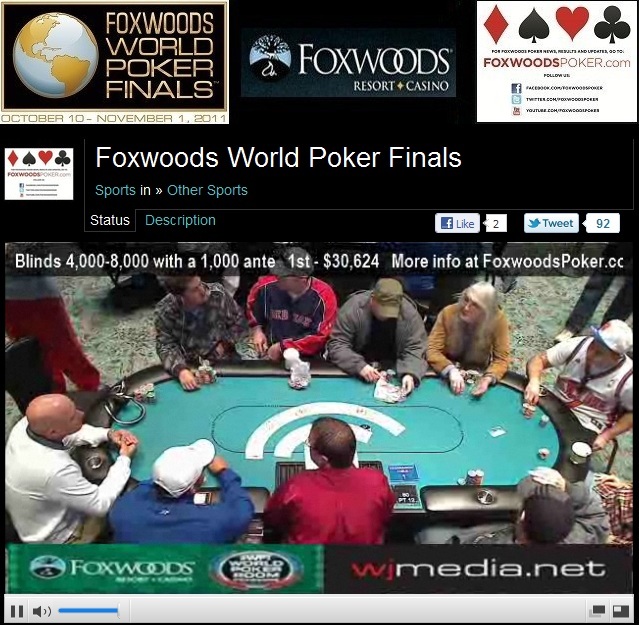 We had a total of 141 players in the $400 Omaha High/Low 8-or-Better event at the Foxwoods World Poker Finals. The board runs out [8c][6s][4s][Qc][Qs] and O'Donoghue's tens hold up to eliminate Vogler in 4th place for $9,007. The board comes [9d][6s][3h][4s][8s] and O'Donoghue catches runner runner to make a flush and eliminate Kaplan in 5th place for $7,012. The board comes [Jd][Tc][4d][3s][7h] and O'Donoghue pairs his jack to win the pot. Cohen is eliminated in 6th place for $5,662. Kathleen Kamb moves all-in for her last few chips with [As][Tc] and is called by Tod Liang in the big blind with [Ac][Ad]. The board runs out [Js][8d][8s][2d][6d] and Kamb is eliminated in 7th place for $4,696. The board runs out [Kc][6d][2d][9d][Ac] and Liang spikes an ace on the river to win the pot and eliminate Barbagallo in 8th place for $3,796. The board runs out [Th][9c][7c][5c][5s] and Liang improves to a full house to win the pot and eliminate Enfelo in 9th place. Mike Goncalves has been eliminated from the final table of the $400 Deep Stack event when his [Ac][Th] could not hold up against the [Kd][Jh] of Brian O'Donoghue when a king hit the turn. Goncalves takes home $2,123 for his 10th place finish. 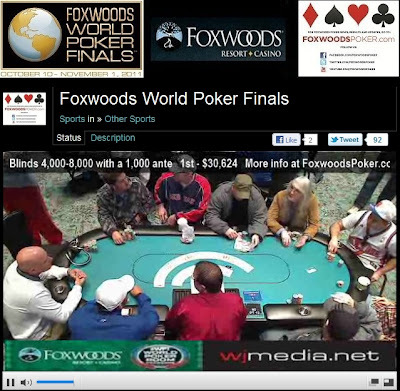 We had a total of 289 players in the $500 NLHE Deep Stack Bounty event at the Foxwoods World Poker Finals. $400 Deep Stack Final Day Now Streaming Live! The final day of the $400 No-Limit Hold 'em Deep Stack event is now streaming live. Just click "Watch LIVE Video" at the top of the page to view the live stream. There are 40 players remaining and the blinds are 4,000-8,000 with a 1,000 ante. $500 Deep Stack Bounty Event Underway! The $500 No-Limit Hold 'em Deep Stack Bounty event is now underway. Players start with 20,000 in chips and the levels are 45 minutes in length. The blinds are currently 25-50. Players earn $100 for every player that they eliminate.